The Echograph iPad app produces beautiful, creative animated GIFs with simple, intuitive interface and navigation. The simplicity of the tools combined with the opportunity to integrate DSLR photography and video straight to your iPad is an interesting juxtaposition and makes the Echograph iPad app desirable for any and all interested in creating, sharing, and checking out quality animated GIFs. The striking home screen is filled with animated GIFs carefully chosen by the Echograph iPad app developers and staff. The animated GIFs provide a bold backdrop, while a cool menu bar shades the left third of the screen. With one touch, you can adjust settings, create, view, and learn about the Echograph iPad app tools and functions. The view option defaults to your library, but you can view staff picks with one touch sorting. You swipe horizontally to view GIFs. You can share your animated GIFs, but not necessarily everyone’s GIFs. To get the scoop on how to use the Echograph Pad app, you touch the learn icon. You are transported to a web page with information. It is not unusual for photography and video iOS apps to incorporate a smart, witty video to introduce your users to features, and this addition would certainly enhance the Echograph iPad app with the small investment in this additional marketing collateral. To create a video, you can select from a video saved to your iPad library, or you can create one from within the Echograph iPad app. You simply touch create and the start button. There is a 30 second countdown in the area of the red button. You can stop filming before 30 seconds, but the video automatically ends in 30 seconds. 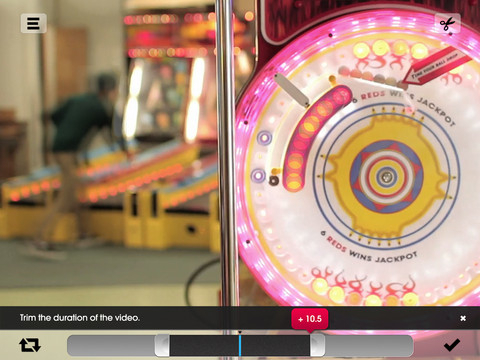 You then have the chance to cut the video to five seconds using a volume style adjustment at the bottom of the screen. You can adjust the length from the beginning and the end with responsive, agile finger gestures. There are pop-ups to let you know how much your video is over or under five seconds. When you have established the length, you select a frame to serve as your still shot with the volume adjustment. The next step is to select the area of the screen to animate by rubbing your finger on the specific area of the screen. You can pinch the screen to determine the circumference of your finger swipes–a larger circumference makes a larger area to animate and vice versa. You have a back button and chance to view live with a touch to refine your animated GIF. There are two different resolutions to choose from when you save. You are warned that higher quality requires more time. You can share with Facebook, Twitter, and Tumblr. If you register with Echograph, then your animated GIF may be selected to share with the community. The social networking aspect of Echograph is much more subtle and limited–unlike Cinemagram and Gifture. The focus of the Echograph iPad app is clearly on creating high-quality animated GIFs. You can purchase a USB to import DSLR directly into Echograph for $29.99. This is an optional upgrade, but would certainly be worth the investment for those interested in maximizing their digital photography. The Echograph iPad app is slightly more expensive at $4.99, but the functionality and refined tools elevate it above animated GIF apps that cost around $2. AppSafari review of Echograph was written by Jenni Ward on August 28th, 2012 and categorized under App Store, iPad apps, Photos, Utilities, Video. Page viewed 3985 times, 1 so far today. Need help on using these apps? Please read the Help Page.